I cannot believe I’ve not shared this yet. This is my signature dish, my pièce de résistance, my show-stopper! When something unbelievably hearty and warming is needed on a cold, miserable day this is the only recipe that will do. 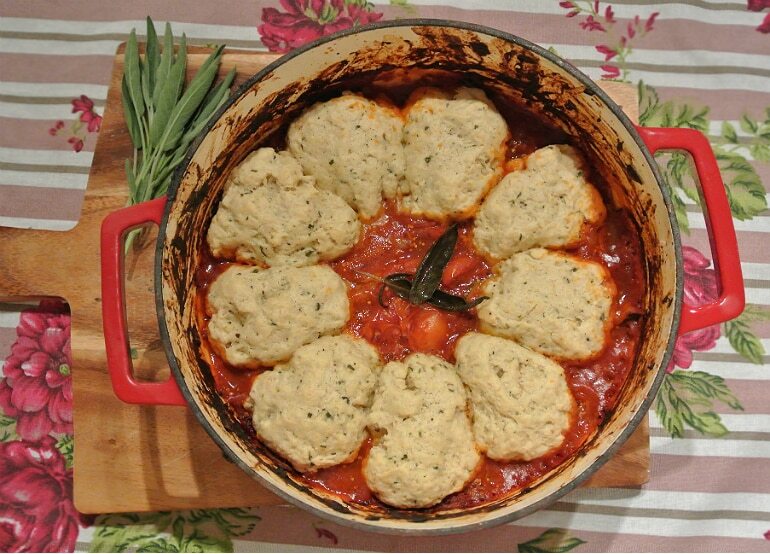 It’s full of rich meat and chunky veg, topped with stodgy, herby dumplings that are a dream to dip in the thick tomato sauce. 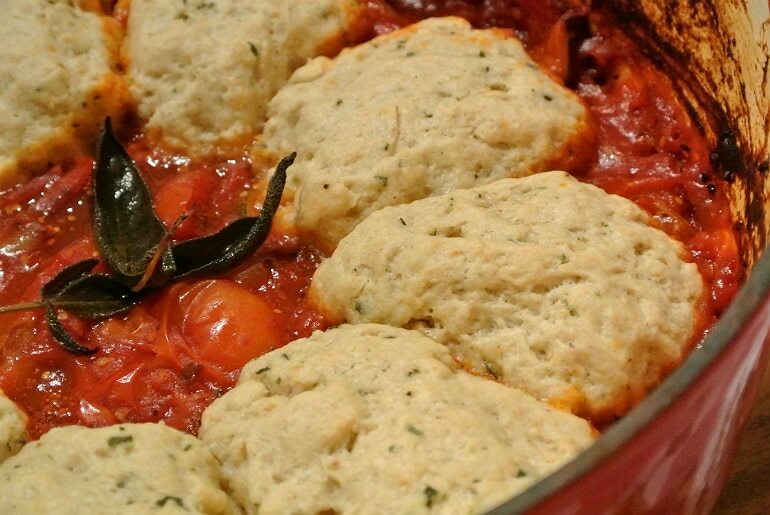 Seriously, even the fluffiest of jumpers pale in comparison the comfort this dish brings! Have I hyped it up enough yet? Are you ready? Let’s go! Melt your butter with seasoning and thyme in a large pot on a medium heat. Once heated add the diced onion and cook until soft, add the balsamic to de-glaze the pan and make the onions sweet. Add the minced garlic. Place in the lamb chop and allow them to brown on each side. Now add in the tomato purée and mustard and stir until coated. 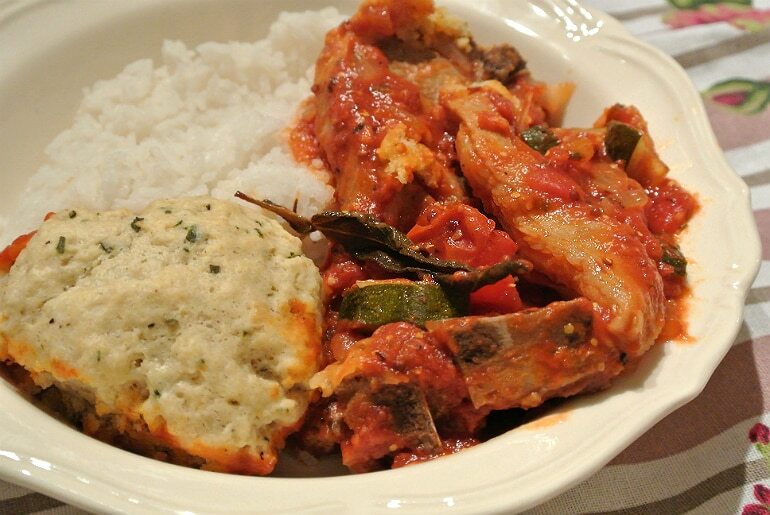 Add the courgette, fresh tomatoes and chopped tomatoes and stir well, but carefully so as not to break up the meat. Roll the dumpling dough into large balls and place in a ring around the edge of the stew, give them a gentle press so half of the dumpling sits in the sauce. Now cover with a lid and cook in the oven for 15 minutes. Remove the lid and bake for a further 5-10 minutes until the dumplings are lightly golden and crisp on top.